"Yweah! Wets! A wook owut of cwages!" said Stacey, starting to run ahead. "That sound just like him!" replied Ziona. Day 2 – Favourite Playable Race? This one is easy for me; Half-Elves. I’ve always liked Elves since reading Lord of the Rings waaaaaaay back. There is always a sense of mystery and etherealness about them, as well as their natural grace and skill. BUT, most Elves often have a sense of aloofness and arrogance about them. Which is why I prefer the Half-Elf over them. You still have some of this almost other-worldly feel, but they are somewhat more grounded than your regular Elves. There is also the fact they have the whole ‘a foot in two different worlds but belonging to neither’ aspect. Anyone who is a fan of Star Trek’s Mr Spock should recognize that trait. Do they try to fit in one society or the other? Do they try to live up to both? Do they reject one or both of their heritages? There is a lot of character potential there, as well as plenty reasons why a Half-Elf might take to adventuring. Being the permanent outcast, they are suited to being a wonderer on the road, or trying to prove themselves. Mechanics wise, Half-Elves have historically been somewhat underwhelming, though that never stopped me from playing one. But in the current 5th Edition they are arguably one of the stronger races, especially for any Charisma based character. "So we should keep heading down then?" Asked Fenn. I’m sure most of you will have seen these challenges around. Where you have a question a day on your views on a certain topic you need to answer for 30 days. So me and a friend decide to do one in tandem. Only we ended up choosing different topics! And I thought I’d share mine here just for the fun of it, even if no one is interested. At first I thought it would be easy to do, as I’ve been role playing for a long time now (even if my gaming is in something of a drought right now). But on the other hand, this is a DnD specific challenge, and I haven’t played as much DnD compared to other games. For fantasy I’ve mostly played in Iron Heroes games (sorta a low magic, somewhat more gritty variant of DnD) and in the DM chair it was almost exclusively Mutants and Masterminds (I had a very long running superhero campaign world). But nevertheless, DnD does hold a place in my heart, so lets get to it. The short version is pretty simple. There was a role-playing society at university, so I signed up for it, enjoyed the taster session, and then joined the DnD beginners’ game that started up. Of course, that raises the point of how did I know to look for a role-playing society in the first place. Well for that, I know about DnD from the original Baldur’s Gate game, which I got shortly after getting my first computer. (Never finished it though!) And the manual does make it clear that it is based on the DnD pen-and-paper game. And so, when I reached Uni, I sought out a role-playing group and thankfully found one. And I’ve been gaming since. "So much for my quiet life here. Take that!" Said Antoine kicking one of the soilders into a tree rendering him unconscious. "Um...I got a mutton in ye oven.." Said the other guard fleeing. "Good thing I train my sword play everyday! It's no longer safe here..guess I'll go back to Mobotropolis." Said Antoine heading out. "Hey big guy watch out for the falling debr..." Said Bean as a piece of falling debris hit his extreme and sent flying. Bark sighed and began to pursue the little green duck. "This wouldn't be a problem if I could fly even though I'm a bird!" Joked Bean as he kept soaring. "Did it just get darker?" Said Charmy flying up into the air and spotted the winged fortress. Lego games are always great, I remember the first Lego games I ever played were basically my childhood. Nice, I didn’t have much orbs to begin with so I had to use all 40 of mine to try for Hrid, only to get a pity breaker of Laevatein. I had to use all of the 235 orbs I saved for the New Years banner. EVERY. SINGLE. ONE. So did I get him? After 50 I got Gunnthrá and went on to get pity broken by Ares, Male Morgan, Flier Nino (yep a green pity breaker cause I apparently don't want Fjorm...) and Brave Celica. I got down to my last 10 orbs, at this point I gave up, but I went on to press summon, 2 red orbs appeared. First one was a 3 star Olivia. I had no hope for the last red but tried anyway. 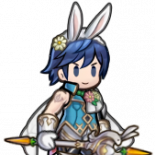 Hríd! ON MY LAST POSSIBLE SUMMON! "They said it was down!" Sarah said. "I dunno where"
"Whewe awe the cewws?" asked Stacey as he caught up with Sarah. "You're looking for a door with lots of security," Ziona commented dryly to Seviper. "I'll try. Come on Max. She's gonna have a hard time with that legless blighter." Said Zangoose as he and Max followed behind. Ziona sighed as Stacey headed after Sarah. "It looks like it," Ziona commented to Zangoose. "You keep an eye on the kids, make sure they don;t get into any more trouble. I'll try and do the same with Seviper." "And I'm going this way!" Said Seviper. Happy birthday to my older brother @Clay Heartrend! I was right about the Renais twins getting Christmas alts! I struggled to get them and Christmas Chrom, overall took over 500 orbs... but I got on another account and have started saving up orbs and got the twins this time in 17 orbs! Haven't tried Chrom yet. but forget Chrom! Our December legendary is Azura, the banner is pretty cool but i'm skipping it. Fjorm Gunnthra LaegjarnLaevateinHridAs you could probably guess, I nearly screamed the second I saw Hrid among the new years units! in my exact words, I said "No one can beat Christmas Ephraim!" Oh boy I was wrong! and we just got normal Hrid a month ago! I expected Fjorm, and the others were no surprise, BUT HRID?! Also we have Fjorm as a green bow flier, Gunnthra and Hrid was red sword fliers, Laevatein is a clear healer cavalry and Laegjarn is a blue lance cavalry! Also Laegjarn is the free Tempest Trial unit. Welp Rip my orbs, I'll likely struggle to get Hrid... Also everyone's srtworks is beautiful! Fjorm is the only one with their original artist. So is anyone going for the legendary banner or saving for new years? Who are your targets? "I wanna go for the cells!" Sarah said huffily. "So I'm going!"